Like most journalists working on the Hill, I try to conduct my personal affairs in such a manner as to resist allegations of bias towards the politicians I cover. I do not put up campaign signs during elections, I make no donations to political parties and keep my voting intentions to myself. I don’t even answer telephone polls on politics. It’s not that I don’t have political views — my friends, family and some of my colleagues know them. It’s just that expressing them publicly will inevitably, to some, undermine the perceived credibility of my reporting. This is a standard practice among Hill reporters. Few of us want the headaches of dealing with charges that we’re in the tank for a party. I know many journalists, commentators and politicians in Ottawa have a soft-spot for communists, many probably thought themselves communists in their youth, others likely still are communists, still, this is bizarre. How Brian knows which journalists continue to subscribe to a discredited economic system, I cannot say, given the above disclaimer. But, let’s digress a bit and rewind the tape to 2005. Long before Sun TV, Lilley was covering federal politics for radio stations CJAD and CFRB. (At the time, he worked out of the Parliamentary Press Gallery “Hot Room,” where I still work). During the election campaign that year, the Conservatives were heavily pushing a plan that would scrap the Martin Liberals’ proposed national child care program and replace it with a $100 per month payment for every child under age six. When CTV National News reported on reaction to the plan, who did they find to give it a enthusiastic endorsement? Step forward, the Lilley family of Ottawa. LLOYD ROBERTSON: And in the election campaign with a deep freeze forecastover many parts of Canada, Conservative leader Stephen Harper unveiled a plan today sure to warm some wallets. He unveiled a new child care allowance. A money in your pocket pledge for those with young children. It’s aimed at seizing the agenda on child care from the Liberals. And while other leaders were quick to denounce the plan, for some young families on a budget reaction was quite different. CTV’s national affairs correspondent, Lisa LaFlamme reports. 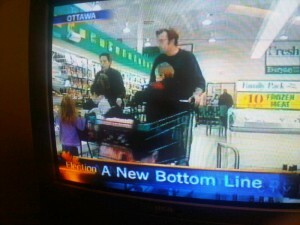 LISA LAFLAMME (Reporter): Two carts and four kids under five. The Lilleys have been doing the math and like the sound of a new bottom line. Under the Conservative child care plan, the old baby bonus is coming back, $1,200 for every single child under six. BARBARA LILLEY (Mother): Well, look, it will save us $400 a month so, yeah, that buys an awful lot of diapers. LAFLAMME: Barbara Lilley is a stay at home mom. Competing with preschoolers at a play centre, Stephen Harper unveiled his two part plan. The new allowance, he says has no strings attached, available to everyone regardless of income. STEPHEN HARPER (Conservative Leader): In fact the only people who should be making these choices are parents, not politicians, not the government. LAFLAMME: Part two is all about daycare. $250 million in tax credits to help communities create more spaces. It’s daycare that illustrates the big difference between Liberals and Conservatives. Tories don’t agree with a government-run system. Liberals, of course, just negotiated daycare deals with the provinces, $5 billion over five years. PAUL MARTIN (Canadian Prime Minister): Mr. Harper has said he does not believe, and I quote, in subsidized child care and early development. Well, I do. LAFLAMME: The Martin deals would end in a year. JACK LAYTON (NDP Leader): This is not a child care plan. It won’t create any child care spaces. It’s a tax plan and the leader should know the difference. LAFLAMME: This child care advocate says more money should go into day care, not in parent’s pockets. MONICA LYSACK (Child Care Advocacy Association of Canada): Having a little bit more money to be able to do that I don’t think necessarily will solve the problem for them. There still isn’t an adequate system that’s available for all children in Canada. LAFLAMME: It will help Barbara’s brood, paying the price, she says for opting out of daycare. LILLEY: For those of us who decide that we don’t want to do that, then it’s sort of sorry, bye-bye, we don’t really care about you. We don’t count. LAFLAMME: $4,800 a year just won the Conservatives Barbara Lilley’s vote. Lisa LaFlamme, CTV News, Ottawa. Although he is not quoted in the clip, Lilley is seen in several four shots. Now, I don’t know for certain if Brian felt the same way as Barbara about the Tory child care plan. I certainly don’t share my wife’s views on every issue. But if she planned to put our kids in a national news TV report endorsing a plank in a party’s platform during an election campaign — on behalf of our family — I might strongly suggest she reconsider. Otherwise, people might start speculating about our political beliefs. Some might even think we’re commies. SIDE NOTE: I‘m not sure how the LIlley tribe ended up on CTV, but I’d take a guess it might have something to do with a producer named Kris Sims, formerly of Ottawa radio station CFRA and, later, a producer with Mike Duffy on CTV. Lilley and Sims worked together in the Hot Room and she now also works at Sun TV. Also, I don’t have a copy of the video but would gratefully receive a link Lilley explains it was a friend at CTV who asked his family to appear, but not Sims. So, she wasn’t involved. So Brian Lilley goes on national TV looking for a government hand out? The thing I find strangest is that some people take Brian Lilley seriously. Having checked out SUN from time to time (I thought I should give it a chance rather than just assuming it would be horrible and not trying it), the man doesn’t have an ounce of credibility. I’m honestly a little surprised he doesn’t wear a Steve Harper button on tv. Though, to be fair, he’s no Theo Caldwell. I wrote a retort on Brian Lilley’s website today… I guess he chose not to post it – and instead just posts the ones that support his views. Don’t you see? The only reason Brian Lilley appeared in that item in the first place was lay the groundwork for his subsequent outing of the journalistic commies that surround him. He is now above reproach, having shilled for the Conservative party. Brian Lilley is playing chess while the journalists around him play Go (which, being of Chinese origin, must be Communist). Are you admitting to be the arch enemy of feminism – a controlling Patriarch – daring to tell the world you are or would coerce your wife to not offer up her own opinion. Likewise you choose to infer Mr. Lilley is somehow involved in similar coercion of his wife and that he is somehow controlling this situation. You accuse him of inferring the dipper is a commie, which she might be, but then tar him in the same manner. Pot meet kettle. You don’t have to tell us your politics. It can easily be inferred from these and past scribbles, not too mention J. Ibbetson that thoughtful sycophant at the G&M. Yeah. The first thing I do every morning is look through the mail just before it goes straight to the garbage to see what you have to say. Sushiboy21?? How the hell do you get to post on NNW.. Right. I forgot that NNW to a 90 degree turn to the left about a year ago. Goodness, you Albertans see anything you don’t like as having a left-wing slant, don’t you? I read Mr. Lilley’s article, as I see it he doesn’t criticize reporters for having political views, he criticizes them for having communist sympathies. You, otoh, criticize him for having political views, even though, as you say, he is not even quoted in the article you hold up as ‘evidence’. Just another example of fine Canadian journolistism. What a ridiculous story, Sushiboy21. Canadians are not so stupid as to not be able to decipher which journalists hold certain views. Lilley rightly criticizes communists, and you criticize his wife and mother of 4 for supporting the Conservative party. Judging by this drab, I think it’s fairly obvious where your support lies. Why is this even on NN!? Communism is not just an “economic system” – it is a system of total societal control, and it is also responsible for the state-sponsored murder of approx 100 million people in the last century. The fact that so many journalists in the national press corps are left-wing loonies is not a trivial matter – the filter they apply in reporting our national debates has a great impact on socciety. Just wondering what this story is about and why I should care now about what Lilley’s wife thought about the child care benefit six years ago. Is this about Lilley, the writer’s choice to keep silent about his political leanings or Mrs. Lilley’s diaper choice? For myself, I would rather know a reporter’s or commentators political leanings so that I can gauge what I am hearing. Nothing is more misleading (and dishonest) than for a person to pretend to be neutral when they are really favoring one side or another. We need a new word to describe Brian Lilley, because he’s clearly not a journalist. A reportisan? A conserventator? I’m just spitballing here, but treating him like he’s actually a journalist does a tremendous disservice to people like Glen who actually take the time to consider their professional obligations and act on them. You mean ‘professional obligations’ like attacking Mr. Lilley for the views of his wife? Was Lisa Laflamme aware that Brian Lilley was then (is still ?) a member of the Parliamentary Press Gallery? If she was, why did she choose to feature his family in the piece, if that was somehow against journalistic practice? If information about Lilley’s profession was not deemed relevant then, since Laflamme and others at CTV didn’t seem to think it relevant, why bring it up now? Surely a journalist worthy of that designation would be able to rebut a colleague’s opinion about the political views of his colleagues without such a petty “revelation”, eh, Mr. McGregor? Why are you so sensitive to Lilley implying some members of the Press Gallery may still adhere to the same political POV that they may have espoused in their salad days? Anyway, wasn’t Lilley’s blog post mainly about the interim NDP leader and her political connections, NOT about you poor journalists who have purportedly been misrepresented? Did anybody else catch Brian Lilley use his show to play the Planet of the Apes YouTube viral video advertisement in which a soldier gives a monkey his AK 47 only to have the monkey start shooting at him and his fellow soldiers. Lilley treated it as an actual YouTube video rather than an advertisement. e even called the soldiers (AKA actors) idiots. I’m not sure if the idiot comment was more of a pot/kettle or a people in glasshouses type situation, but I do know it was vintage Lilley.